I did something today that I’ve never done before, and am pretty upset at myself for. I pulled out of a race. Sigh…I was signed up for the inaugural Orange County Triathlon that was supposed to take place this Sunday up in Newburgh, NY. But alas, I was just not ready for an Olympic Distance race right now. My training has been haphazard at best, and the last time I completed an Olympic distance tri on haphazard training, I hated every single minute of it, and did pretty poorly. I didn’t want a repeat of that. I don’t know what is wrong with me, and why I let myself go so long without proper training. I’m calling it the Toughman effect. The Toughman is A half ironman distance race I did last year, which I was thrilled to have completed, but lead to a burnout like no other. Maybe after this summer, my head will be back in the game. Slightly bitter disappointment…meet sweet reward. This weekend, I baked on the fly. Not something I would ever recommend, because inevitably, something goes wrong. 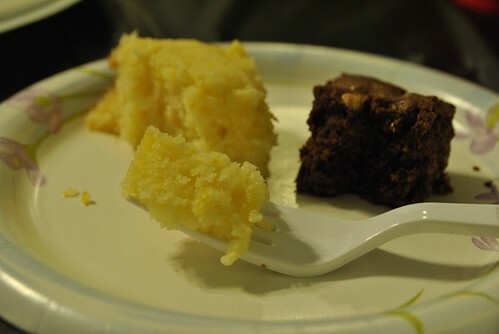 Alas, I had committed myself to bringing two desserts to a BBQ that was happening in two hours. Why do I do this to myself? First up, Orange Ricotta Pound Cake, Giada style. I have made this pound cake three times, and every single time, something different goes wrong! I don’t know what it is, but I seem to be getting worse with every try! I don’t even make substitutions in this one! The only thing I could think of that was questionable was the flour I used. I was lazy, and did not mark this one container I have in my pantry. Unfortunatly I can’t seem to remember if it was powdered sugar or cake flour or maybe something entirely different. I tasted it, and it was not powdered sugar. Let’s hope it was cake flour! Second thing, I might have done wrong. The measuring cups. It is time for me get a scale. These measuring cups are cute, and great if precision isn’t required. However with baking, precision is required. I also used a whole milk ricotta from Target’s Market Pantry line. A little tasteless, but nice and thick in texture. 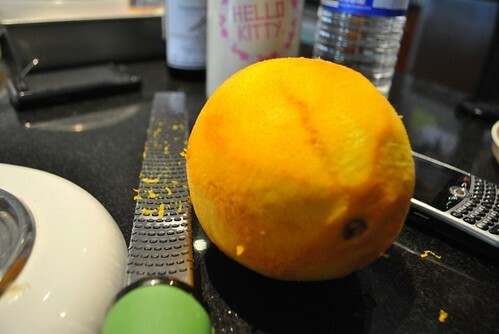 The recipe also calls for the zest of one orange. The only orange I had was a monster sized orange. Nothing wrong with that! So, what happened? Well, I got the batter mixed up nicely, and I poured it into my loaf pan. 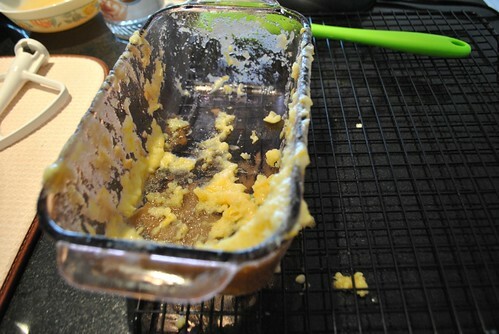 However, after about 20 minutes of baking, the batter started overflowing the pan! Thank goodness I threw a cookie sheet in the rack below, otherwise I would have had an even bigger mess on my hands. 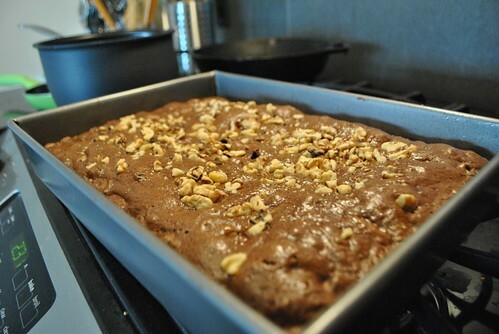 Not knowing what to do, I decided to pull it out of the oven (carefully of course) and I threw it on a cooling rack. 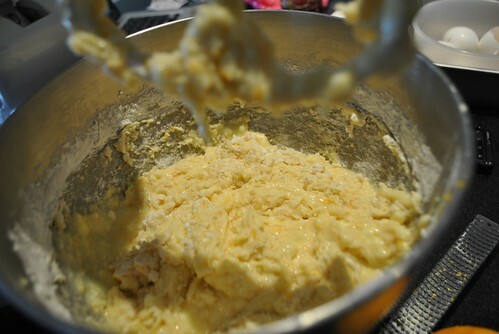 Then I quickly buttered up an 8×8″ cake pan and carefully (not neatly) poured the half baked batter into the pan. This was messy. I then threw it back into the oven to let it finish baking. 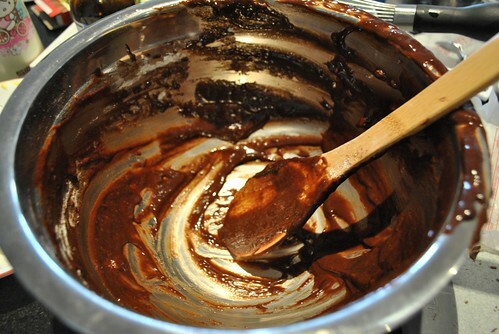 While that was baking I started on my brownies. I used a recipe from The Joy of Baking website. which I’ve always had good luck with. With a lot of kids present at this BBQ, I decided to double up on the recipe last minute, which left me in a bit of a bind with the chocolate. I only bought 7oz of the good stuff (50% cause not everybody likes dark), and I needed another 3oz. So I pulled out some old Bakers semi sweet and used that. Kids don’t care, as long as it’s chocolate right? and some awesome looking brownies! The poundcake actually tasted delicious despite appearances. The ricotta, while contributing nothing to flavor, gave it a nice moistness and helped showcase the oodles of orange flavor that ran through it. A nice way to offset the amount of butter normally in these things. The brownies were awesome. The use of the 7oz of a 50% dark and 3oz of a semi sweet really worked out well. The brownies were neither super sweet nor chocolate bitter. It was the best of both worlds really. It also came out perfectly fudgy while slightly cake like. 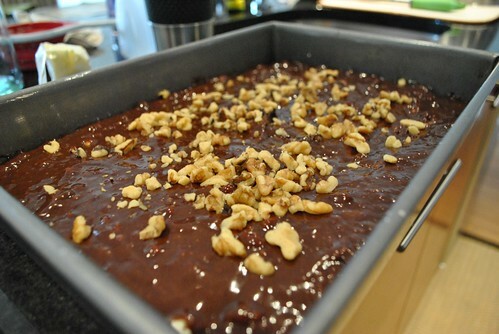 It’s the all around brownie! So there you go. 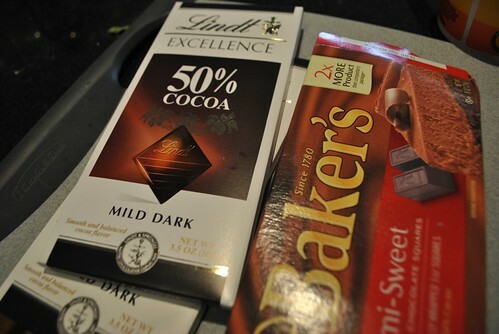 Slight disappointments in life can be remedied with some sweet rewards. Now where’s my brownie? 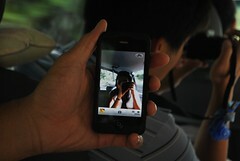 And as always, all pictures can be found HERE! 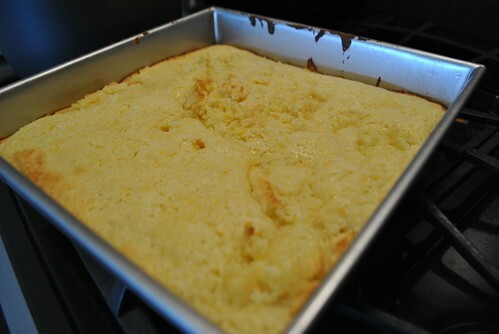 Update (8/16/11): I tried the orange ricotta pound cake again, but this time I bought a new box of King Arthur’s unbleached Cake Flour and used that. This time I went straight for the 8×8″ Cake pan, greased it up with the leftover butter wrappers (works really well!) and poured it right in. The 8×8 is the perfect size for this. How this fits in a loaf pan, and how I got it to fit in a loaf pan the first two times, I have no idea. 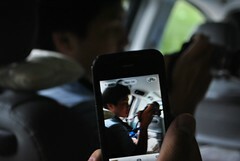 Use the 8×8.